HM Manufacturing is a leading manufacturer of custom precision gear racking and the pinion gears used for types of positioning assemblies. All products are made in the USA. We specialize in manufacturing custom gear rack and custom pinions that are made to order and are often asked to add features to many standard style parts. We’re committed to ensuring your projects are done accurately, efficiently and on budget. ​Our rack and pinion gears are precision machined to close tolerances and are typically used to manipulate an object up or down stream or a component across a linear action. The rack and pinion gears are two different types of gear shapes which convert rotational motion into linear motion. Using a powered round gear (the pinion) pushes on a linear straight gear bar called the rack. 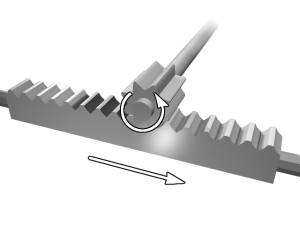 As the pinion turns, the rack slides across a bearing surface (sometimes sealed) back and forth. One example is the rack and pinion of a hydraulic steering column that applies hydraulic force left and right. These forces complement the torque applied by the steering wheel using a hydraulic manifold that divides the hydraulic force from the left side to the right side of a piston. This piston has an exposed rack on on one side. If you require a special length, torque requirement, life span or special travel length, we will manufacture your custom gear rack and custom pinions based on your drawings or damaged parts sent to our facility. You can specify your custom gear rack and custom pinions material types made of aluminum, steel, bronze, cast iron, delrin or stainless steel.